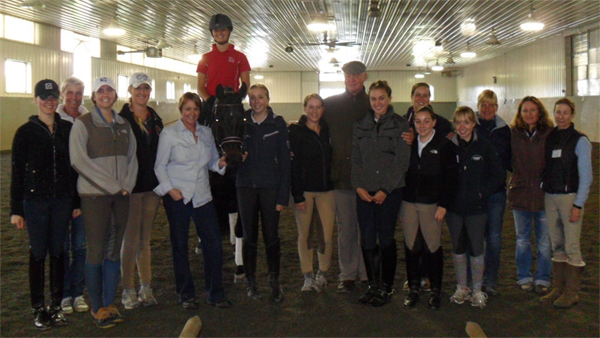 May 4 - 6, 2012 was a special weekend for all of those who attended the dressage clinic with Conrad Schumacher at the Ashby Stock Farm. Friday was open to adults and many of the trainers of the attending JR's and YR's took advantage of this. From as far away as Florid as the riders came to learn and be inspired. Mr Schumacher's patient teaching style builds ones confidence up to try that little bit extra and let loose just the right amount to let the horse thru. His working patterns are interesting and fun, he is always committed to keeping the horses engaged and happy. Although the work is just that, work, the horses become motivated in his program and the riders able to feel the right moment to ask, and to give. This feeling creates a balance and thoroughness that makes it fun not only to be the rider but for the spectators as well. Saturday and Sunday was left for our Region 8 JR/YR's. We had representatives from ponies thru Brentina cup riders. The participation was fantastic. The girls each had lessons with Mr Schumacher as well as a lunch time fitness lecture by Kerry Madden of Fitness Your Weigh in Groton, MA. Saturday night Mr. Schumacher gave a wonderful lecture after dinner talking about theory and competition. After the lecture he very graciously answered questions from the girls. The questions were well thought out and very important to today's dressage sport. Their participation in the discussion brought even more information to the table and it was great to listen to the dialogue. The lessons on both days covered rider position, skillful giving of the aids and riding patterns. Accuracy in the movements was of utmost importance as this showed if the horses were truely on the aids. Alot of time was also spent on the correct neck position, spending extra time to show the rider the correct feeling if Mr. Schumacher did not think the rider understood. This time helped the horses to become more supple in their backs and move freely thru their bodies. Riders participating in the clinic were ; Lisa Cross, Gayle Paquin, Mary Ann Grant, Susan Mercer, Shan Lawton, Ariel Matisse, Clair Glover, Nancy Later Lavoie, Kelly Hendrick, Taylor Lindsten, Chloe Cosgrove, Katelyn Kok, Laura Hope Gammell, Nicole and Kristin Nowak, Hope Cooper, Emily Smith, Kate Mancosh, Eleni Econopouly and Ciara Cummisky.